1. Listen to or read instructions carefully before attempting to do anything. 2. 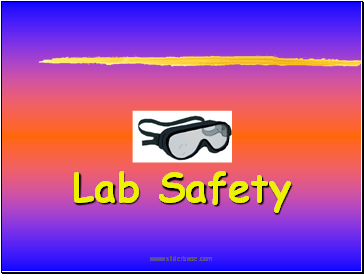 Wear safety goggles to protect your eyes from chemicals, heated materials, or things that might be able to shatter. 3. 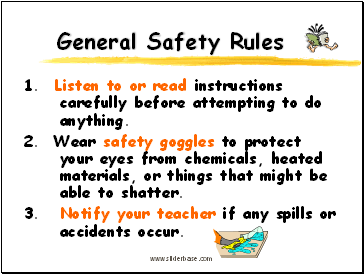 Notify your teacher if any spills or accidents occur. 4. 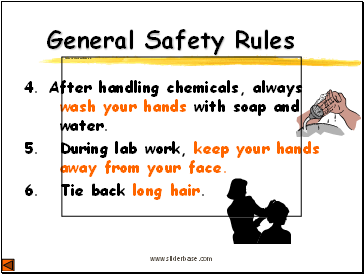 After handling chemicals, always wash your hands with soap and water. 5. During lab work, keep your hands away from your face. 6. Tie back long hair. 7. Roll up loose sleeves. 8. Know the location of the fire extinguisher, fire blanket, eyewash station, and first aid kit. 9. Keep your work area uncluttered. Take to the lab station only what is necessary. 10. It is suggested that you wear glasses rather than contact lenses. 11. Never put anything into your mouth during a lab experiment. 12. 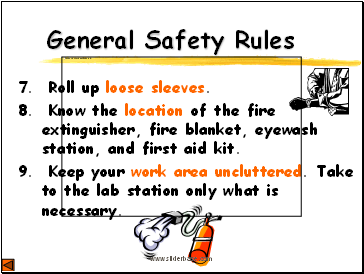 Clean up your lab area at the conclusion of the laboratory period. 13. 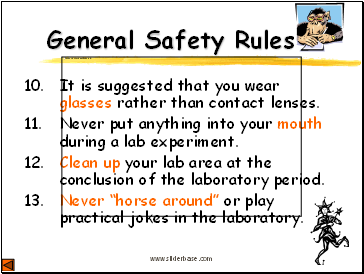 Never “horse around” or play practical jokes in the laboratory. 1. Chipped or cracked glassware should not be used. Show it to the teacher. 2. 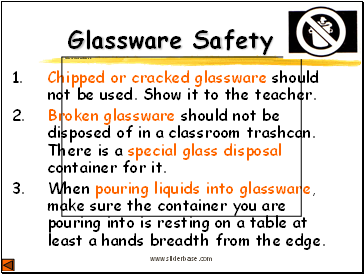 Broken glassware should not be disposed of in a classroom trashcan. There is a special glass disposal container for it. 3. When pouring liquids into glassware, make sure the container you are pouring into is resting on a table at least a hands breadth from the edge. 4. Pour down a glass stirring rod to prevent liquids from splattering. 5. If a piece of glassware gets broken, do not try to clean it up by yourself. Notify the teacher. 6. 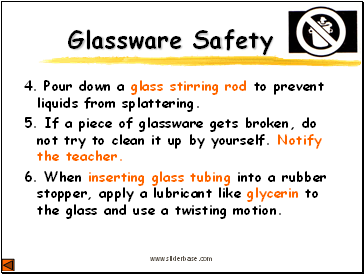 When inserting glass tubing into a rubber stopper, apply a lubricant like glycerin to the glass and use a twisting motion. 7. 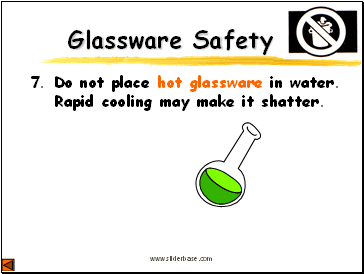 Do not place hot glassware in water. Rapid cooling may make it shatter. 1. 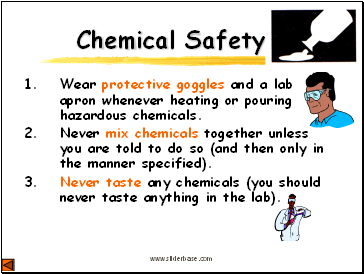 Wear protective goggles and a lab apron whenever heating or pouring hazardous chemicals. 2. Never mix chemicals together unless you are told to do so (and then only in the manner specified).